Wild About is a celebration of the flora and fauna commonly found in our cities. Instead of fact sheets, this space will showcase books, art, music, societies, and whimsical objects about urban-adaptable plants and animals. Wild About was inspired by the Animal Love series at Design*Sponge. If you would like to see your favorite urban-oriented plant or animal featured, please email us at info(at)localecology.org. Ginkgo biloba is the inaugural species in the Wild About series. The ginkgo is one of my favorite trees. I used to keep a list of blocks planted with ginkgo in Boston. I've never eaten the fruit or the nut; like the durian or the jackfruit, the ginkgo's highly pungent smell is a deterrent. The female tree bears fruit and many cities have responded to complaints about the malodorous fruit by specifying only male ginkgo on their approved list of tree species. Oh, and the fruit's pulp contains the allergen ginkgolic acid. (By the way, the fruit is a pulp covered seed and not botanically a true fruit.) 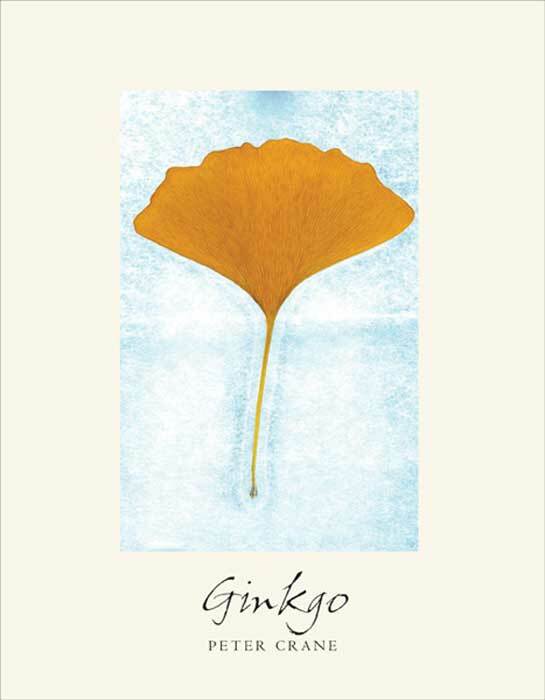 A few more facts about the ginkgo. The tree is a living fossil with a 250 million year history. The ginkgo is the third most common street tree in Manhattan and the 10th most common street tree across all boroughs. The dean of Yale School of Forestry & Environmental Studies, Peter Crane, is the author of Ginkgo: The Tree that Time Forgot, a book he started at Kew and finished in New Haven. The book, which I borrowed from the library and am 30 pages into (the book is 277 pages long excluding the notes and index), chronicles the tree's 250 million year history "from its origin, proliferation, and eventual decline, to its reprieve, renewal, and resurgence through its association with people." If you want to learn more about this tree, check out Cor Kwant's Ginkgo Pages which Crane acknowledged in the book's preface. 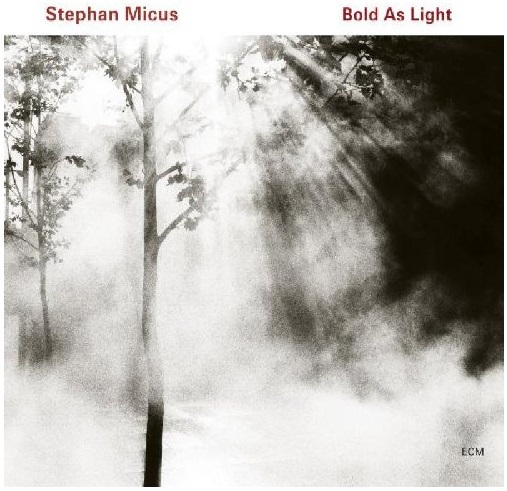 The 10-song album, Bold As Light, by Stephan Micus features a "song" (part 6) titled Golden Ginkgo Tree. The instruments for this song are the kalimba, a linguaphone from Tanzania and the shakuhachi, a Japanese bamboo flute. The piece is beautiful! 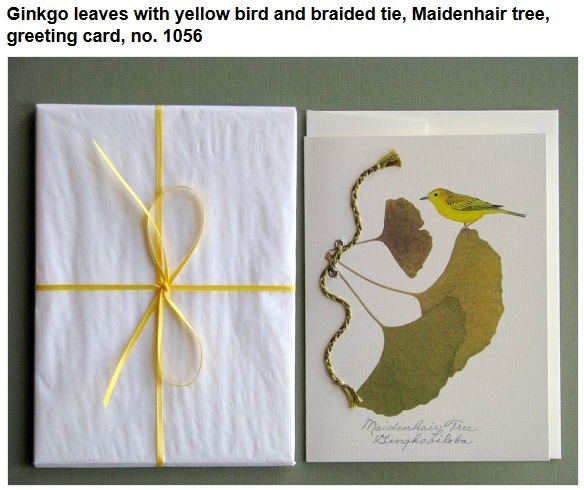 Flat Flower Design botanical artist Andy has several ginkgo-themed cards but I particularly liked the one above because of the inclusion of the yellow bird which resembles a Yellow Warbler. P.S. 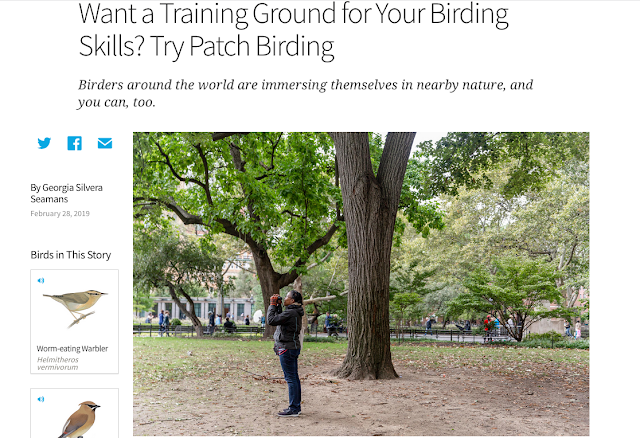 Ginkgoes are trendy, according to Gardenista. We've always thought the tree is timeless. I was trying to find some info on the ginkgo trees that survived the bombings of Hiroshima and Nagasaki and stumbled upon it.